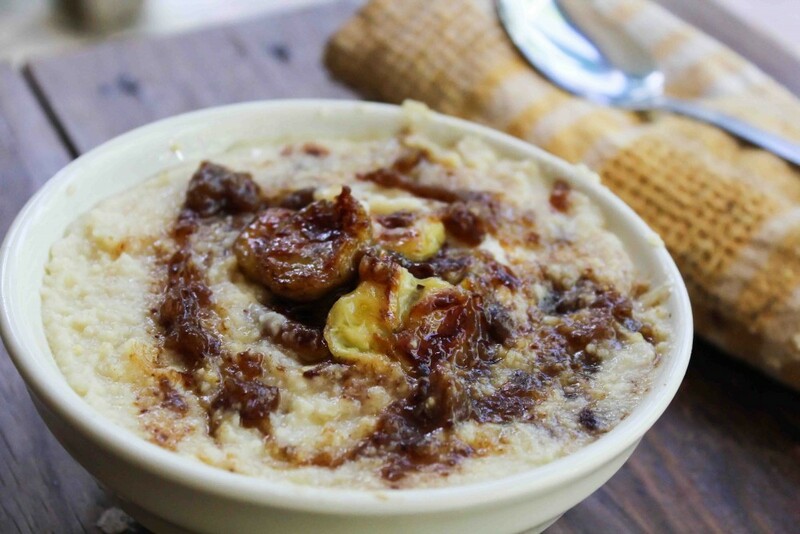 There is just something about the word caramelized that makes you feel like a master chef and when you say caramelized banana salted caramel millet porridge you know it’s going to be one delicious morning. With all this caramelized being thrown around at breakfast time you must be thinking this is just crazy, no one should put that much effort into breakfast, but this low effort breakfast is truly somethings special. 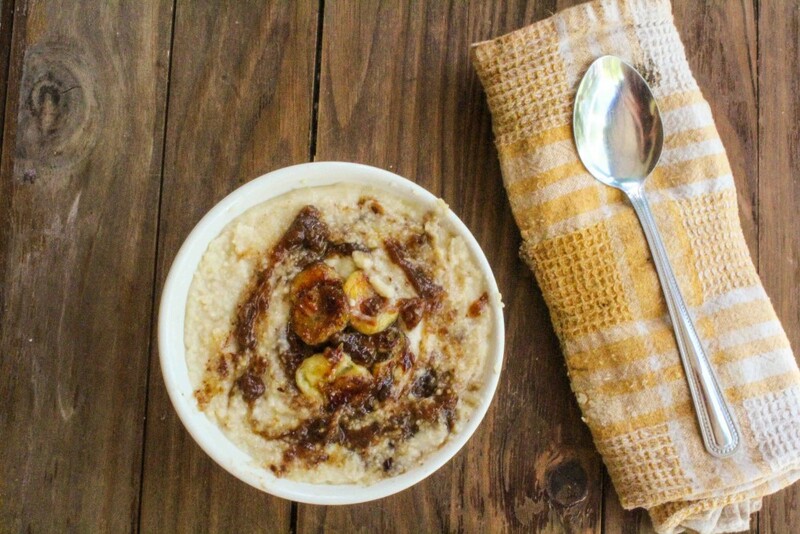 Caramelized banana is something special, it brings out all kinds of gooey, sweet banana-y goodness that will make you not want to have banana any other way again. Why would you when banana can taste so darn amazing? Let’s have a quick chat about millet, what is millet you might ask? This delicious seed is what your breakfast has been missing all this time. Have you ever tried something and instantly fell in love at first bite? That’s what happened to me the first time I tried millet. 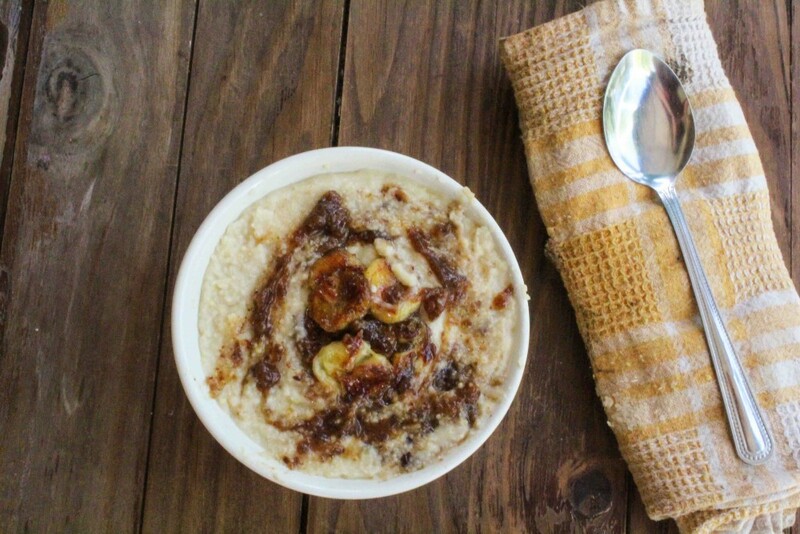 Everything about it just made me instantly fall in love with this porridge. When I started reading about all the nutritional benefits, my love for millet grew exponentially into a stalker-esque relationship. This pseudo grain-seed is naturally gluten free, high in fibre, helps maintain stable blood sugar levels, it’s even alkanizing which makes it easy to digest, perfect for sensitive stomachs. Adding a drizzle of my healthy salted date caramel sauce, gives it that decadent dessert feel, that will make even the pickiest eater want to devour this. So put on your fancy pants, because things are about to get fancy and it’s not even brunch! In a large pan toast the millet until fragrant and lightly browned. Place millet into blender and blend until it resembles a flour. 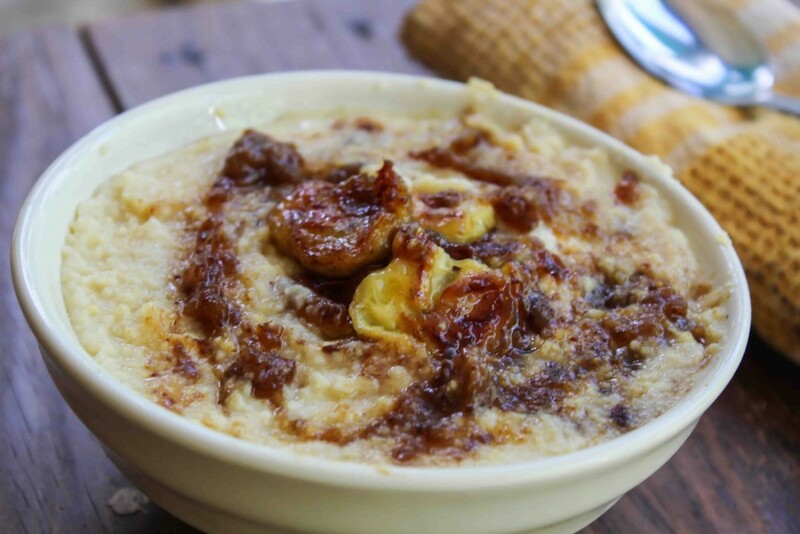 This is not an essential step, but if you want a creamy millet this is the way to go. In a medium size pot over medium high heat, add the millet, water, vanilla, cinnamon and salt. Bring to boil and reduce to simmer, while stirring continuously. Cover slightly and cook for 5 – 10 minutes. Add the milk and stir in. Remove from heat and lightly sweeten if needed. Remember the caramel sauce and bananas will be really sweet, I never sweeten the millet for myself, but if your really feel like treating yourself, sweeten that millet. In a pan over medium high heat, add the oil, maple syrup, vanilla, cinnamon and milk. Bring to boil and reduce heat. Add the bananas and cook until browned on both sides, getting that delicious goo on both sides. 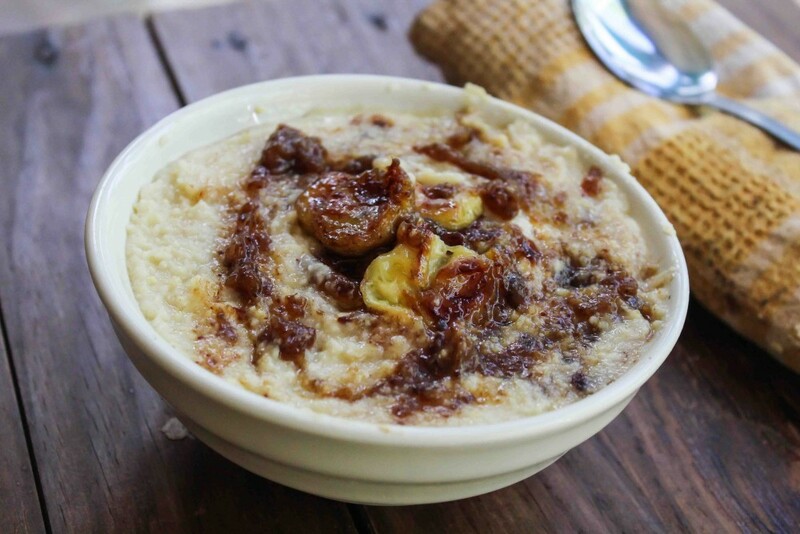 In two bowls divide the millet porridge, add a swirl of caramel sauce, and arrange your bananas on the top. Serve immediately.